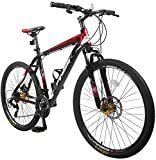 Welcome to Top 10 Best Mountain Bikes Under $500 2019 Reviews feature. Mountain biking is one of the quickest growing outdoor sports in the country. Finding a great mountain bike under $500 is a challenging task, you have to spend many hours to find the gem. As a beginner, it can be tough to buy first mountain bike particularly if you don’t know the features and accessories to check. 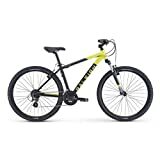 So, if you’re looking for any model that is durable, light-weight, comfortable, safe, and appealing, then check our reviews along with pros and cons of these mountain bikes under 500 to decide quickly which model will meet your needs and requirements. Below are the Best Mountain Bikes Under 500 to buy in 2019. The Merax Finiss Mountain Bike shifts and brakes with the best of them whether you are navigating an obstacle-filled trail or speeding down the single-track path. It comes with 21-speed Shimano derailleurs. The frame material is aluminum, which Merax claims have been heating treated. This hardtail bike has 80mm suspension fork for the quick, sharp handling on a lower center of gravity. It comes with front & rear mechanical disc brakes. Maximum weight limit of this mountain bike is 330lbs. Nashbar’s 29er is a budget-friendly pick that will introduce you to the world of single speed mountain biking. Buying a single speed mountain bike sounds t little crazy at first, but there are some of the advantages to single speed riding. It grows your riding skills and forces you to concentrate on technique instead of relying on gears. The Double-butted Chromoly frame guarantees strength and durability. Its sturdy 29” tires buffer you from rocky trails. The quality tektro brakes take care of your stopping power. Comes with a single color. 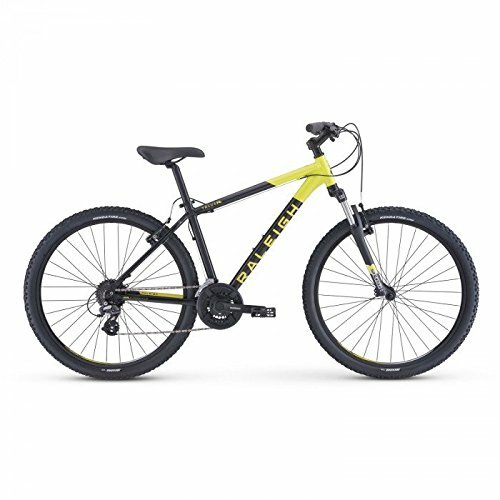 This bike is the perfect fit for mountain biking on flatter terrain or shifting up steep slopes. 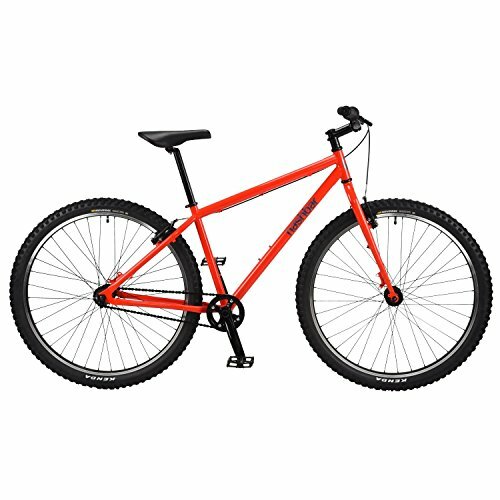 This mountain bike is a durable ride that helps you tackle single-track trails with ease. It offers full-sized 29” tires. The 2.25-inch wide knobby mountain tires are ready for the bumpy terrain. It comes with 24-speed Shimano EZ-Fire trigger shifters for a gear range that is ready for varying terrain. It features an aluminum mountain frame and powerful Schwinn suspension fork. The rear and front mechanical disc brakes assure impeccable stopping power when you are out on a ride. It comes with a 5-year limited warranty. Very handy on the trail. 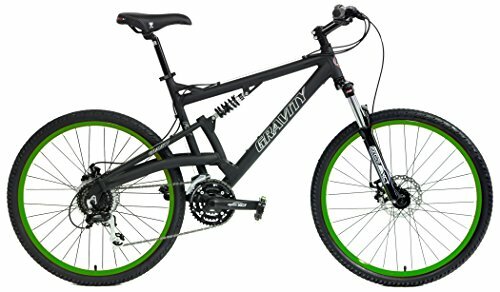 Gravity FSX 2.0 mountain bike is excellent for new and experienced riders which is both reliable and affordable. It features the dual full suspension feature with advanced aluminum frame. It is a versatile type of bicycle with various sizes to fit anyone comfortably. It is made of an advanced aluminum frame with a single pivot technology. It comes with the 24-speed control system. It offers uncompromised features of comfort, gear shifting gear experience, and gives a full shock suspension for overall control of your ride at any speed. The brakes of this bike is a Tektro Novela Disc which helps in assuring that you have total control of your bike particularly when you’re riding uphill or downhill. Women who are looking to hit the trail for less should check out Diamondback’s Lux bike. 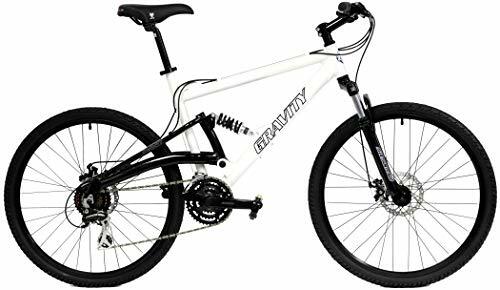 This bike is created to fit many different body shapes and sizes with the efficient hardtail design for climbing hills and an 80mm suspension fork for stably traversing rocky paths. The aluminum aqua frame is powerful yet lightweight. With 24-speed drivetrain, this mountain bike is ready for your next adventure. The 27.5-inch wheels provide great traction and stable ride. 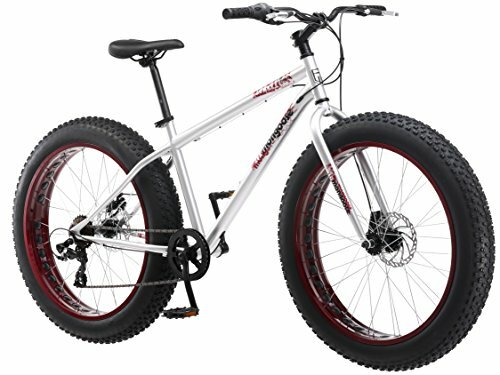 Perfect mountain bike for those who are the overweight or large-bodied rider to ride over any weather in sand, mud, dirt, and snow. This bike is called “Fat Bike” because they feature wide tires that give the rider a feeling of floating on the road. 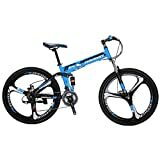 You will clear rocks with ease thanks to the bike’s great cruiser frame and take on hills easily with 7-speed shifting. The fat tires are able to roll over road obstacles with ease and comfort. The front and rear disc brakes for the stopping power in wettest conditions. It includes the threadless headset for better adjust ability. Great bike for all terrain. Assembly is easy and quick. Needs better packaging for the shipping. This entry level bike is suitable for the trail riding and all-mountain riding also you can ride through city roads or neighborhood with this fantastic piece. The frame of this bike is constructed with a high-quality hydroformed aluminum alloy with the flawless welding points. It comes with 24-speed Shimano EF51 shifters that provide the rider with the wide variety of gears to choose from. This bike has a super suspension system. It comes with front and rear suspension forks attached to its 26 inches wide wheels. The dual suspension absorbs bumps and shocks forthe maximum comfort. It is used top-notch technology for the uninterrupted performances. The frame is extremely lightweight. Does not come with the kickstand. This is excellent for those who want to switch between mountain biking and some light road biking. 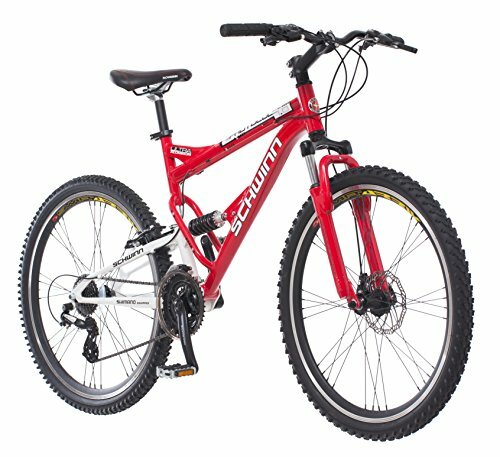 It is a versatile, lightweight mountain bike with the alloy frame that is super easy to maneuver. It comes with 27.5-inch wheels. The wide 2-inch mountain bike tires help you to stay nimble but stable over bumps. It offers some of the best visibility of all the bikes on our list. If you’re looking for the bike for the single track or down hills, then this mountain bike is excellent for you. It has 26-inches wheel range. It features 24-different speed control. This bike has built-in full-suspension that gives high-performance bicycle and makes it a perfect choice for adventurous rides. The bike features a dual suspension that guarantees you of smooth rides all the time. It is designed with a durable and reliable aluminum frame that provides you the support when you’re riding. It comes with reliable front disc brake and rear alloy V-brakes that serve you stop regardless of the condition. You require to do some assembly when you get your package. Folding Mountain Bike from EUROBIKE ideally combines high-end performance with the budget-friendly price range. It is made of a 16-inch frame that is made from high carbon steel. The frame is styled with the 26 inches wheels and comfortable saddle. The tires include 3 spoke fashion rims made from the sturdy magnesium alloy. Also, tires provide dual suspension mechanism to the bike. It comes with the dual disc brake that provides great stopping power. The bike comes 85% installed. This bike is lightweight and easy to move around. The following information will educate and guide you in choosing the mountain bike that best fits your needs. Frame Materials: Mountain bikes are designed with various types of frames. Mountain bikes are framed with other materials like steel, fiber, carbon, and titanium. Every type of frame has its pros when it comes to weight and durability. If you need a durable and lightweight mountain bike, choose a model that is designed with aluminum alloy. The steel frame is affordable and tough but it is heavy. Also, you can get mountain bikes with titanium frames and carbon fiber which are lightweight but they are expensive. Wheel Size: The wheel sizes differ on mountain bikes. Mountain bikes generally come with 26, 27.5 and 29 inches wheel sizes. 26-inch wheel is standard size and it is perfect for the beginners because they provide more control. However, the larger wheel, more comfortable it will be for you to tackle obstacles when riding. Gears: Typically, the number of gears the mountain bike has is a result of the number of front chainrings times the number of sprockets on the cassette. It can get up to 30 gears. Bikes with the single chainrings and wide-range cassette with the cogs from 9-11 are the most widely selected. If you plan on using the mountain bike on steep hills, you would need one with more gears. 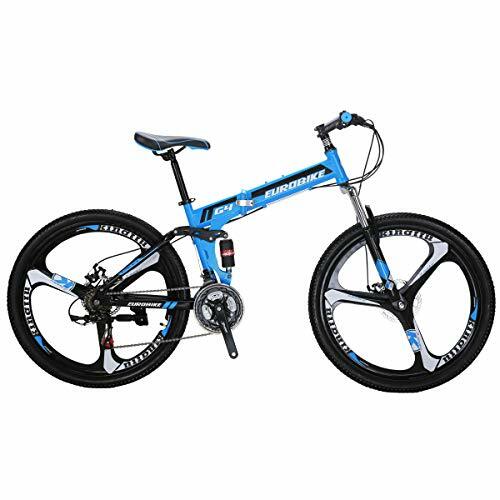 Suspension: There are 3 different types of mountain bikes; hardtail bikes with fork suspension in front, the second type is rigid bikes without any suspension and last is the full suspension with front and rear fork suspensions. 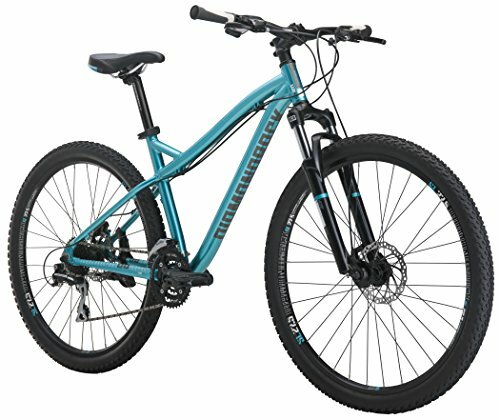 Hardtail bikes are common at the low-end price. Its frontal suspension gives the front wheel impact absorption but the rear with none. Mountain bikes with the rigid suspension are cheapest and require far less upkeep. Full suspension bikes are typically touted as the best for mountainous terrain, having suspensions in the front and rear. Brakes: Brakes are essential to safe mountain biking. We have disc brakes and rim brakes on offer. The former is suitable and powerful for all kinds of situations. While the last offer solid grips but not all the time. 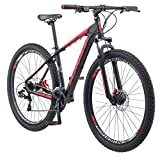 As you can see that we have compiled a brief yet explained the list of Top 10 Mountain Bikes Under $500 2019 that can be easily available in the market. There are many good mountain bikes in this range, but must be aware that there are most of the dead ducks too. It is advisable to avoid the cheap plastic components because they are not as solid as metal and are liable to rupture quickly. So, what are you waiting from select your dream model and get ready to ride!